Look out for this very Fishy Road Sign that will lead you straight to Kampung Babagon River Tagal. Want to enjoy some relaxing cold crystal clear water without going to the Tunku Abdul Rahman Park Islands or spend a day away from the stressful city life? Here’s what you can do if you’re planning to go somewhere nearby, there’s a place called the Babagon Tagal River In Penampang which will only take about 30-40 Minutes drive from the Kota Kinabalu city centre. Make sure to bring some extra clothes and towels because there are gonna be a lot of swimming when you are there. Let’s see if the crystal clear water doesn’t make you want to jump in to have a short dip. Trust me you won’t regret a single bit as the cold crystal clear water will take away your stress and put you in the most relaxing state ever. Have a dip and just relax at the riverside and enjoy the calming sights and sounds of nature at its finest. Throw away all your problems and leave all your troubles in the city and just enjoy. Well! What are you waiting for? Christmas!? Jump In! In Ya Go! Super tempting crystal clear water that is super hard to resist not to go in. If you ask me, I think you wouldn’t have the chance to ask because I’ll be the first one to jump in before you get the chance to ask. Other than swimming in the amazing crystal clear water, Babagon river is also one the best place to bring the family along as it has a lot of family activities to do there and one of it is to have your riverside family picnic. Enjoy the scenic views and also the relaxing surroundings together with your family and friends. Enjoy some barbecue wings along the river, and top it up with some cold drinks to complete your weekend escape from the city life. When you’re in Kampung Babagon, you will have the chance to see the daily life of the local villagers there as there are many farms and fruits orchards in the area. So chances of you seeing the locals carrying fruits around the area is quite normal there. Don’t be shy with the locals as they are very friendly and welcoming to almost anyone who visits, just ask them politely and they might sell you some of their freshly grown fruits or maybe get a sample of it. One of my favourite thing to do in Kampung Babagon River is of course FISHING! With the proper permits and agreements from the head of the village, you will be allowed to fish the river with one rule that is always Catch and Release all the fishes you caught. Here’s a brief introduction about the tagal system. Tagal is a system that is applied to most of the rivers here in Sabah and it is aimed to conserve and protect the rivers and also the Pelian or Mahseer fish from being over harvested. Each tagal river is a no go for fishing and it is only opened once a year for the local villagers to harvest the fishes in the river. One of the fine examples of the healthy Mahseer Fish caught in the Babagon River. Catch, Photo, and Release! Thanks for the thrill! In my opinion, Babagon River is one of the best places to visit and the best part is that it is not very far from Kota Kinabalu City Centre. Don’t know where to go for the weekends, plan your trip up to Kampung Babagon Tagal River and enjoy! 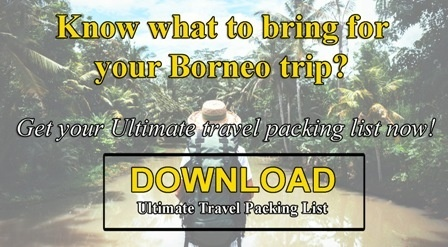 Do you want to know the top 5 day trips that you can do in Sabah Borneo? 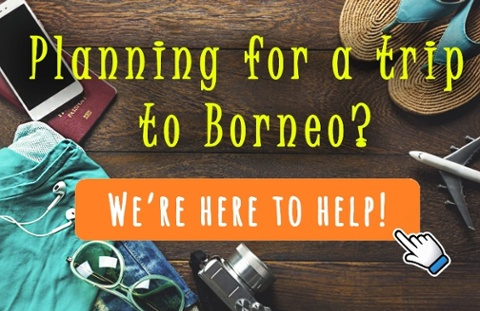 click here to read our blog on “Top 5 Day Trips To Do in Sabah Borneo“. Sabah, Borneo’s lush tropical rainforest and rich coral reefs, and colourful culture has made Sabah a great place to travel. Incorporate them with the relatively low prices for travelers has put Sabah as a must go-to place to visit. The only way to really experience the beauty of Sabah is basically to backpack your way from one end to the other. But if you don’t have the time, there are still many things to do on a daily basis. Adventurous is your middle name? Then try out quad biking through dirt roads, up and down muddy slopes, across lush greeneries, and feeling the cool breeze on your face, all while having Mount Kinabalu as your backdrop. Nature lover by heart, but not much time to kill? Enjoy a slow river cruise down the Weston Wetland Park and get the chance to see the endemic Proboscis Monkeys in the wild. Not to mention other wildlife as well, such as Flying Foxes, various types of Langurs, Crocodiles, and loads more. In the evening, be awed by a special performance from the Fire Flies with their “flashing lights” in their habitat. For more information, check out our Proboscis Monkey River Cruise tour, or you can read our blog on Weston River Cruise for you to get the feel before deciding to go for a visit. Sabah Borneo’s culture is rich and diverse and oh so interesting! You might not have the chance to stay with a native family for the next few days, but you can head on over to Mari Mari Cultural Village to experience and learn about Sabah’s diverse ethnicity. From their customs and beliefs, the way they do their chores, cook their food (with wood), how they greet, and so much more! You even have the chance to try out some local delicacies. Something not to be missed! Feel free to read our blog as we share our trip to Mari Mari Cultural Village day trip. Want to know more about the history, architecture, and nature within a day but you just don’t know where to start? Ask the experts and they’ll be glad to show you a few places which fit nicely within a day. Do you know that Borneo was once colonized by the British Colony? They left many of their trails in Sabah and the history behind it is wonderful! Knowing that Sabah is predominantly indigenous people, you’ll be amazed at how mesmerizing the Floating Mosque looks like. Venturing into villages, you’ll see how fast scenery changes from concrete jungles to green landscapes, you’d think you just crossed borders! For booking tour, you can look up our Kota Kinabalu City and Nature Tour. Sabah Borneo not only has you loving its’ food, it’ll want you to share it with your loved ones too. What better way then if not to learn it? Within a day, you’ll be able to learn several local dishes, which are pretty simple and taste nothing like the foods you eat in the shop. Authenticity is what it is and you’ll even mingle around with locals in the fresh market and get your hands down and dirty mixing up all the local ingredients to whip yourself a local cuisine in no time. To know more on how to join this authentic Borneo Cooking Class in Sabah, feel free to contact us here. Moreover, you can read our blog as we share our experience on the Unique Taste Of Borneo Cooking Class Tour. Sabah is blessed with beautiful beaches, sunsets, jungle scenery, villages and its own beautiful cultures. It is no surprise that travelers would come to Sabah just to snap some photos of its surrounding areas. So, let me share with you some of the insta-worthy of places in Sabah that I am sure can make all your Instagram followers be amazed by the beauty of Sabah. One of the perfect spot for locals and tourists to capture Kota Kinabalu city view. However, it would be very cool when you can capture the Kota Kinabalu city view at night from the Signal Hill. An old Welfare building turned into street art graffiti building and other buildings in Gaya Street area, which added some flavors to Kota Kinabalu city and it is perfect to use as a backdrop for model photo shooting. This would be a cool place for you to check out and snap some photos! From #Paris with love… A quick session with @toilehomemadebyirsito.. he made a quick stop with his lovely Mrs.. before heading to rivers and islands here in #northborneo.. hope you have a great holiday.. thanks to @stain.bn for the hookup..
Suhh dude????? been a week since I left Borneo and it feels like forever? Feeling romantic and relax with a glass of cocktail when you are here in Sunset Bar. One of the perfect place to witness the beautiful sunset in Sabah and the surroundings are breathtaking. Thus, it is worth to snap some photos for your Instagram profile! One of the top destinations of Sabah interior, which is surrounded by shady forest and running stream makes the area very cooling and refreshing. It is simply picturesque. You will not need to add filter effects when you snap a photo in this area. One of the beautiful beach in mainland Sabah before reaching the Tip of Borneo, where the combination of beautiful cloudless sky, brilliant deep blue color of the sea and white sandy makes one a pure joy to walk on the beach. It is another reason of this being an insta-worthy spot in Sabah. Want to go visit Kudat someday? Click our Kudat Tour for more inquiries. Homecoming. Picture taken by @shaneyee88 ? Like what you read so far? Make a plan to visit Sabah Borneo. and the best of it, it is FREE to download! Claim your Travel Packing List! A perfect setting for a place to rest and relax, surrounded by the beautiful valley of the Kedamain River, paddy fields, and fruit orchards. Who can resist with the beautiful village area? I know I could not resist it, which is why this place should be one of the insta-worthy spots in Sabah. Experience an authentic village life in Tambatuon tour, which you will never regret it in your life! Camping by the river with this view ? Before reaching Kinabalu Park or Ranau town, be sure to stop by Nabalu town for snack and handicrafts. Not forgotten also to view the majestic Mount Kinabalu, which you can easily see it from the viewing point in Nabalu town. A perfect spot for you to capture photos of Mount Kinabalu surrounded by lush rainforest as your background, and it is no wonder a perfect spot or insta-worthy in Sabah. Good Morning! Here’s to you the magestic Mount Kinabalu with its panaromic view. Happy Weekend! Located at the foothill of Mount Kinabalu, and surrounded by the green pastures, a group of grazing cows, plus the cooling air breeze. It is truly a breathtaking scenery and often chosen for wedding photography destination. Ranau was home to the largest mining project in Malaysia, the Mamut Copper Mine before it ceased operations in 1999. Now, it has become one of the main attractions for locals and tourist to visit. Why is it Instagram-worthy? Just look at the incredibly beautiful man-made lake, scenery, and refreshing air. I wonder what’s down there? Lastly, one of the insta-worthy spot in Sabah would be at the Luang Rock Beach in Kuala Penyu. A bell-shaped rock, surrounded with mossy green rocks, sea, pebbles, rusty-red rockface, and caves as your background will be perfect for photo shooting. Not only that, you can capture an amazing shot of sunsets there!